Factory Cat Mag-HD Walk-Behind Scrubber is the largest walk-behind scrubber from the Factory Cat line. Available in disk or cylindrical, the performance of this machine cannot be matched. The simple design and extremely durable construction makes for an easy clean up in any environment. The Factory Cat Mag-HD Walk-Behind Scrubber is perfect for any job and will transform your dirty floors into a noticeably clean state. 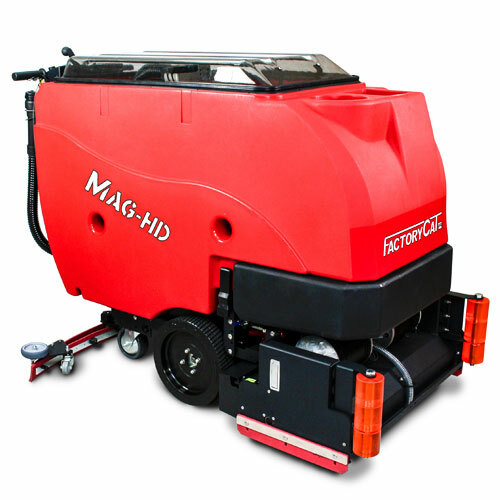 Designed after the original Magnum, the HD machine now has a clear recovery tank lid; resulting in constant view of debris and dirty water. All components are easily accessible to allow for quick maintenance. In addition, the Mag-HD comes standard with heavy-duty tires, LED indicator screen, and a powerful drive system. Call today to set up your free demonstration! Size (L x W x H); 55" x 26" x 40"
Cylindrical Dimensions: 29"- (2x) 6" x 27"
33"- (2x) 6" x 31"